Hi people I am very grateful that you are reading me hope you are liking my work and you can reach out to me anytime you face any issue regarding things I share. I would love to help. You can reach to my content through my YouTube channel and blog of course. So this is about using Splunk tool with your existing IOT project. Splunk is a new tool people are using to monitor or visualize there processes. The processes can be an IOT setup or simple industry process that have connected plants or systems. Sorry for the PJ! Let me take a quick dive into SPLUNK. 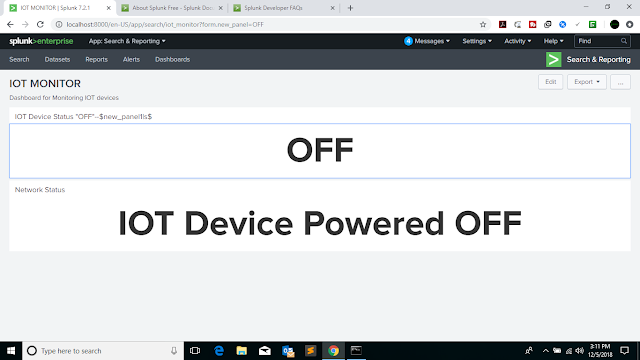 Since I am going to use Splunk on my existing IOT project let me inform you I have shared the blogs and video on how to build an IOT Project. I hope you have heard a lot about IOT that is about connecting different devices on network to generate a cumulative smart output. These devices generate huge amount of data that needs to be stored which is stored by us on cloud storage. We are having so much data being generated everywhere around us not just because of IOT but have so many manual processes have been replaced by machines or devices which have certain parameters or constraints to be kept an eye upon. Suppose you are owner of a house and you have installed some security mechanism or say a safety system which keeps a check on amount of gases present in your house or any leakage of house hold combustible gases. This system ought to have some kind of sensors that will generate some values at some adjusted frequency (real-time in our case because disaster will not wait for specific time). These time specific values are data for us when you have something in abundant you should make the best use of it. People these day are doing exactly this, they are playing with data so as to estimate things or make prediction to make business grow and solve problems before they could actually exist. Because at the need everything boils down to one thing is to create business and generate profit. And we need to be updated with the world. 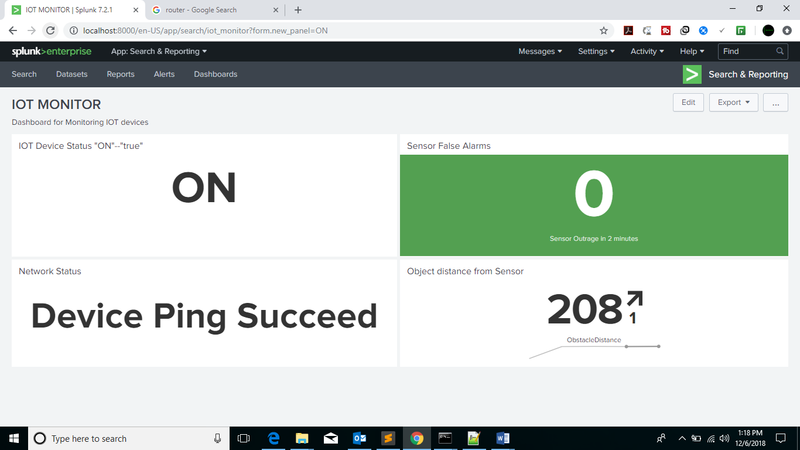 To add this analytical and monitoring feature to our IOT device we are using Splunk although there are many tools out in the market but my own favorite is Splunk. Usage of smart IOT devices in boom, which also increases the error occurrences in IOT devices. For E.g. : False Alarm in Fire Sensor. 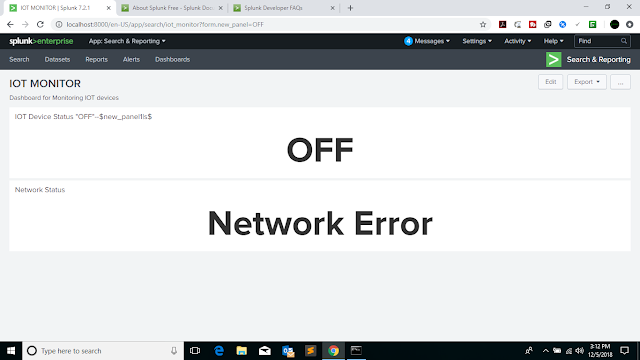 IOT device is Powered ON & Network is up, then Dashboard shows IOT sensor False Alarm (If any) and IOT sensor Realtime Data stats. //^^ did i get an IP "its working!!"